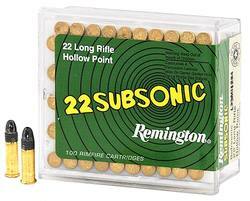 Remington offers the perfect 22 rimfire ammunition for any occasion. Remington rimfire ammunition delivers the quality you expect. That’s because we put the same level of care into making our rimfire ammunition as we do our centerfire ammunition, so you’ll get the maximum performance from every shot. Whether it’s getting young shooters started, practice plinking, small-game hunting or keeping match shooters scoring high, Remington’s rimfire quality stands tall. As in our centerfire ammo, we put the maximum level of quality into our .22s so you can get the maximum performance out of them. Hollow Point Bullet designed for rapid, consistent expansion and superior, on-game performance.